Read more about web hosting! Sign-up now to benefit! Take advantage of sophisticated technology, flexibility and competitive prices and start your hosting business now! RRPproxy™ offers high-quality and flexible hosting services such as the resalable API hosting solution HOMER™. HOMER is the abbreviation for Hosting Management Environment Repository and includes web hosting, virtual servers and dedicated servers. Our web hosting services for webspaces, mailspaces and databases offer flexible and scalable packages meeting all needs for successful reselling. Virtual servers are available in 4 power levels; they are efficient alternatives to conventional servers at favorable prices. 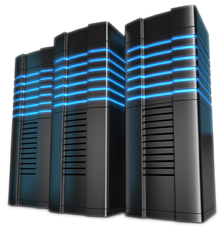 Dedicated Servers are operated on specialized 19” server hardware managed at the TIER III Key-Systems DataCenter. They offer a professional one-stop solution and address business customers and demanding private clients with high requirements for performance and availability. Furthermore, RRPproxy provides you with a highly available and reliable DNS structure for your domains. RRPproxy is not only one of the leading reseller portals for domains, but stands out with sophisticated hosting technology and years of experience!